Recruiting a developer can be extremely time and resource intensive, often taking over a month and costing upwards of $30,000. Given this fact, and given the high level of competition for top talent in the tech world, it’s hard to overstate the importance of finding and hiring the right people for your team. After all, the cost of each new hire is an investment in your company’s future success, and if you invest in the wrong people you’re potentially endangering the continued health of your business. This is why crafting a robust online recruitment strategy to attract top developers has never been more imperative. So, what does it take to hire top talent in tech? If you’re part of a small startup you may be worried that things like astronomical salaries, free gourmet lunches, and adult-playground-style offices are all that matters to job seekers. And yes, some candidates do place a lot of value on compensation and amenities—but still others are more interested in working for a company whose mission they believe in, or one where they’ll have opportunities to learn new skills and advance their careers. Perhaps this is why 79% of startups try to attract talent with difficult or challenging tasks, while 64% use company culture and team-fit as selling points. Keep in mind that intangibles like career advancement and challenging work are not mere consolation prizes for recruiters who can’t promise mid-six-figure salaries. On the contrary, they can be an advantage that smaller companies have over larger, more established players when it comes to recruiting certain kinds of candidates. While a talented developer might get more money and more career stability working at a tech giant like Microsoft, those things might come at the expense of being able to make an immediate, tangible impact with her work. By the same token, a developer might want to have more autonomy over her work, or the chance to make decisions about the product she's helping to develop—both of which would be unlikely within the first few years of working at a large company. If your product is innovative, or likely to make a real, positive impact on people’s lives, there will be developers who are excited by the challenge, or spurred on by the prospect of helping others. Ultimately, factors like these can help your business to stand out from the crowd, attract and retain high quality developers, and, perhaps most importantly, appeal to candidates who can see themselves as a part of the unique culture that you’ve built up. The question, then, is how do you communicate that culture to potential new hires? Taken together, all of the non-monetary benefits of working at a particular company (like all of those listed above) comprise a business’s employee value proposition, or EVP. Your EVP, in turn, should form the basis of your employer brand, i.e. the image and messaging that you project to potential applicants. At this point, the biggest hurdle for many recruiters is defining their EVP and creating text, images, videos, ads, and other collateral that incorporates that EVP in an enticing, eye-catching way. Once this hurdle has been overcome, you can develop a robust online strategy for attracting developers to your recruiting pipeline by promoting your employer brand through various channels to active and passive job seekers alike. After all, how else are people going to become aware of your company and the unique culture and employer value proposition that it offers? 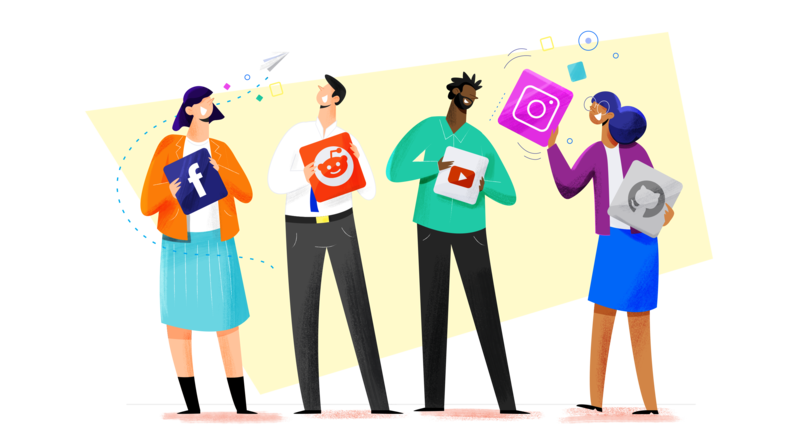 While traditional recruitment platforms like Craigslist and Indeed might have been enough in the past, the modern recruitment market calls for the use of social media platforms and other channels to promote your employer brand. Why? Because only the 20% of candidates who are actively job seeking at any one time have the chance to encounter your brand on traditional recruitment sites. By contrast, the remaining 80% of potential applicants, most of whom would happily change jobs if the right opportunity came around, must be reached on sites like Twitter, Facebook, and Reddit. When they encounter your job ads and other branding on these sites, they enter the first phase of the candidate journey, the awareness stage. As they see your employer brand more and more, they’ll begin to associate your company with the particular EVP you strive to offer, and some of them will come to think of your company as a desirable place to work. Of course, this continuous stream of awareness marketing is only as powerful as the people it reaches. For that reason, recruiters need to be conscientious about where and how they post their content. Think carefully about the demographics of your ideal candidates (i.e. your employee personas) and target your content specifically to them. For developers, this will likely mean building up a strong recruitment marketing presence on Reddit and GitHub, in addition to more mainstream platforms like Facebook and Twitter. This way, by going where your employee personas already, you increase the likelihood that qualified applicants, even those who are not actively job searching, will become familiar with your brand. Careful messaging and targeting can go a long way towards creating visibility for your company. From there, it’s just a matter of leveraging that visibility into a stronger, more robust talent pipeline. This is largely a matter of crafting a smooth applicant experience, beginning with clean, straightforward job landing pages for each position that you’re advertising. By presenting candidates with the information and actions that they want without requiring them to scroll through a potentially complex or unhelpful career site, you prove that you value their time and help to keep them from dropping out of the process prematurely. In this way, you can start building towards a steady stream of applicants who have all encountered your employer brand and consider you a worthwhile option. Again, the value of high quality people cannot be overstated. Not only do they help to strengthen your team, they often provide higher quality referrals, meaning that one talented hire may lead to even more high quality devs joining your organization. In this way, if you have an online hiring strategy in place that attracts the right people into your talent pipeline, the results for your business could be transformative.